We leave Fairbanks on Saturday, July 16 and fly on two, twin engine, planes to Bettles on the south slope of the Brooks Range. 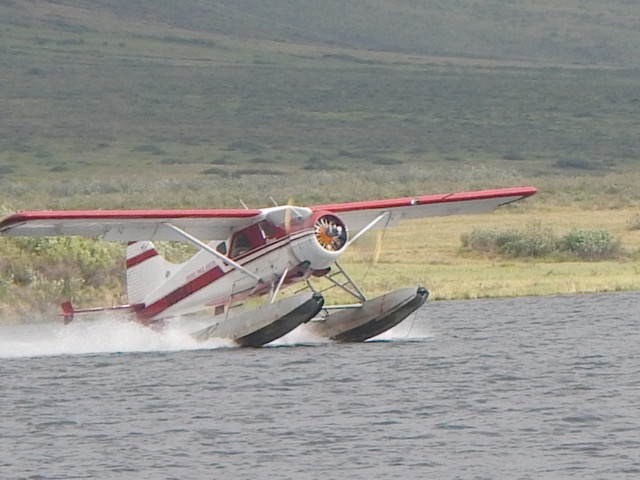 That afternoon or the following morning we shall board a float equipped, DeHavilland Otter and a float equipped, DeHavilland Beaver (both these venerable planes were built in the 1950’s) and make a long bush flight across the Arctic Circle, and to the headwaters of the Noatak River. This flight passes over one of the most spectacular mountain ranges in the world. If the weather is clear we will view hanging glaciers and granite spires just off the wingtips. My niece, Karen Kelley, exclaimed four years ago that this flight alone was worth the price of admission…..but that is only the beginning. It will be followed by over two weeks of wilderness travel by canoe on the largest undisturbed watershed in the world. In past years, we have had close views of Grizzlies, Musk Oxen, Moose, Wolves, Lynx, Caribou, Wolverine, Dall Sheep and incredible bird life. We have caught Salmon, Char, Trout, Grayling and Pike. And we have successfully navigated canyons, rapids, whirlpools and storms. Maybe best of all we have made friends with native Inupiat and had a glimpse of their past and current lives. Who knows what we will discover together this summer? Right now, I am up to my armpits in alligators working with four bush plane charter companies, the National Park Service, the State of Alaska, and my crew of eight. It is a major effort to coordinate and lead an expedition of this magnitude. Looking forward to a safe, successful and adventurous journey. Hoping for fair weather, friendly grizzlies, and good water levels.